I have one last recipe to share with you, from my shrimp boil party last week. 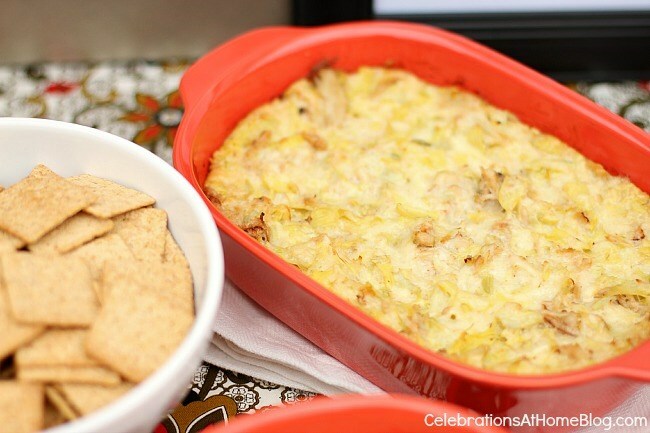 This baked artichoke and crab dip is based on a favorite spinach and artichoke dip recipe I got from one of my BFF’s over 15 years ago. I’ve always wanted to substitute the spinach for crab meat and this was the perfect opportunity. For best results you want to use good quality crab meat. You don’t need a lot, but it should be the good stuff. While claw meat is darker in color and has a strong flavor profile, I prefer lump or special grade. That’s the white meat and has a lighter, sweeter flavor. Secondly, make sure to add plenty of mayonnaise so you get a nice creamy consistency. And finally, chop the artichokes well so it’s easily scooped up. I use my mini food processor for this. Combine all ingredients EXCEPT crab meat, in a medium size bowl. Mix well. Fold in crab meat and transfer to a 1.5 quart baking dish. Bake for about 30 minutes or until hot and bubbly. Serve with Wheat Thins, or butter crackers. Entertaining at Home - how to host a dinner party in 30 minutes.